This is the single formula that expertly combines two of today's leading nutrients. 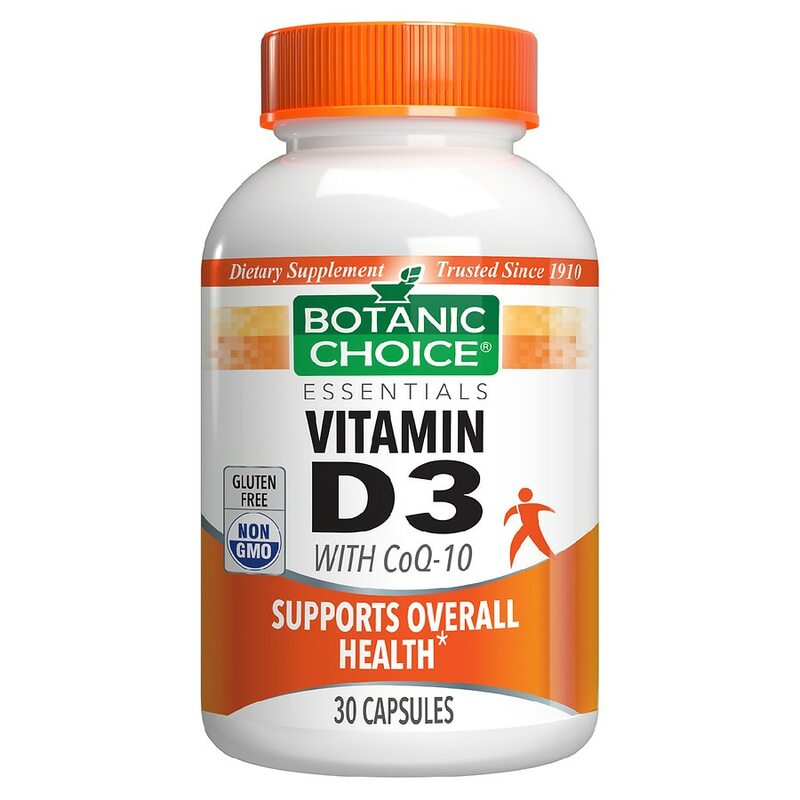 Available only at Botanic Choice, this one-of-a-kind blend gives you 1000 IU of superior quality Vitamin D3 along with a generous 120 mg. of CoQ-10 for heart protection. Why you need Vitamin D3: Absorption of Vitamin D from food declines with age, yet Vitamin D is essential for good health and quality of life. Some experts believe that about half of elderly Americans are not receiving adequate Vitamin D. Vitamin D3 is the same type of vitamin your body naturally creates when exposed to the sun. However, seasons, latitude, smog and other factors can inhibit your ability to synthesize this crucial vitamin. Vitamin D3 also promotes a positive mood and fosters healthy cellular activity including the cells in the breast and colon. It also plays an important role in maintaining a strong immune system. It does so much, no wonder scientists around the globe are singing its praises! Why You Need Co-Enzyme Q-10: CoQ-10 is a naturally-occurring, fat-soluble nutrient needed for cellular energy production and is especially important for the high energy needs of your heart. It also provides powerful antioxidants to protect cells from free radicals. Unfortunately, with age your CoQ-10 levels naturally decline. What's more, recent reports suggest that cholesterol lowering "statin" drugs can decrease those levels even further. Some experts suggest that a daily intake of 100 mg. or more, which you can obtain from this exclusive formula, may be a good choice for the millions of Americans who take statins*. *Caso, G., Kelly, P., McNurlan, M.A.& Lawson, W.E. (2007). Effect of Coenzyme Q10 on Myopathic Symptoms in Patients Treated with Statins. American Journal of Cardiology, 99 (10), 1409-1412.